All On Focus: going out. Angeline and me went to chill at coffee bean in changi airport while waiting for the busy working man gwee to arrive after his work. Before that, i went to border to use the 30% off to buy the first 2 book of eragon... super happy after that. (my consumer surplus shot up) The story goes back when the cashier refused to let me use the 30% discount after angeline used it for her book twlight. The other cashier told him to give me the dicount, but he refused, I was quite angry and left the book there and told them i was not purchasing it anymore. Then back next day to buy. Sigh, the cashier person isn't too kind and should have been more polite. Notice anything different about me? Gwee obviously couldn't spot details well, but yes, others did! 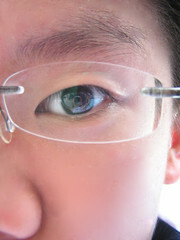 I am wearing contact lens! Sharmaine looks super classy in that white long top. Waiting and waiting for them to quickly get themselves out of the country. It is just so sad to see others travel while you're stuck here. Meanwhile, I have loads to do, but I'm still slacking!